In Uhuru Either Doesn’t Get It or Is Trying To Pull A Fast One On Kenyans, published in the Star on Saturday, I make the case Uhuru and Ruto’s quest for the presidency and vice presidency, respectively is neither about democracy nor about giving people a choice at the polls as they are both trying to have everyone believe. Rather, their quest is about trying to find a way to thwart or altogether defy the ICC process where they face serious charges of crimes against humanity. This is the truth nobody can make a serious case it’s not the case. If Uhuru and Ruto are elected, it would be virtually on account of a majority of two tribes coming together and massively voting for them. But unlike in the past where this has happened whether people like it or not and without any consequences save for post-election violence, the consequences of electing ICC indictees will be dire. It behooves every voter, especially those sitting on the fence to think very seriously and do the necessary to avoid such an eventuality. Just as it’s not about democracy for Uhuru and Ruto to be on the ballot, it’s not true as Uhuru claimed during the debate that by electing him, Kenyans would have passed a vote of confidence that he can do the job. As noted above, people often support their “own” leaders regardless of what they have done simply because they are their own. It amounts to selfishness to exploit this human weakness to seek high office. 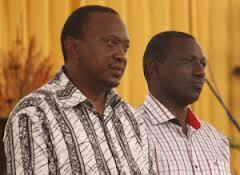 Uhuru can do the right thing and step-aside rather than selfishly pursue the presidency. Meanwhile the majority of Kenyans going to polls on March 4 should show the rest of the world that Kenyans know better than to put themselves in such a precarious position. I would rather think Machiavellian; as Moi once said, ‘Kenya iko na wenyewe’, recently as if joking Kibaki said that ‘they’ cannot let Project Kenya fail..I think that Ruto/Uhuro are part of a bigger project by people in this country who must keep power.